So the time of year has come again where the central heating is turned up that extra notch, the nights are drawing in, and the sound of the howling wind gives you chills down your spine. No its not a scary movie, its time for Halloween! Every year, thousands of children embark on the longest walks of their lives knocking on neighbours doors and receiving lots of sweets, chocolate - and in some cases money! The supermarkets sell the little plastic tubs for sweets and other small treats.... but what about the big stuff? 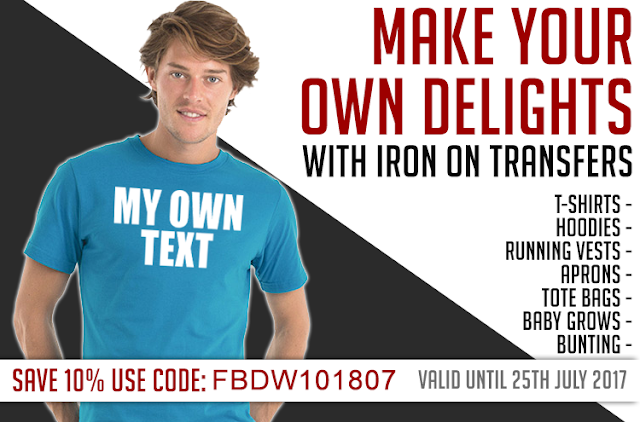 Here at TeeTransfers we know that our iron on transfers work great for a number of different applications. But each year we discover something new, something fun and most importantly something cheap to make! We all love wearing a T-Shirt for Daves Stag do, or even a cheeky little sash for Rachaels 26th Birthday party, but not wanting to leave our little ones out - maybe its time you put your iron to even better use and make the little angels (before costume) something they can carry round with them - and even make it with their own name / slogan on. We have a massive range of iron on letters and numbers not to be sniffed at, we have also have one of the largest ranges of Iron on Halloween Transfers in the UK. with over 20 different colours, 3 different sizes - we are pretty sure there will be something that suits you down to the ground! To celebrate Halloween 2012 we have just introduced a new scary font called "Creepy". This font really looks the part, and can be ordered as single letters, or even as a complete word - using our super fast transfer ordering system! The creepy font (as pictured on the the bag above) really looks fantastic for anything ghoulish! Ok, so usually our approach to making such a creepy design would require the use of a pillow case (which is so popular!!!) we have intrduced a new range that we will be adding to our website very shortly. Tote Bags! 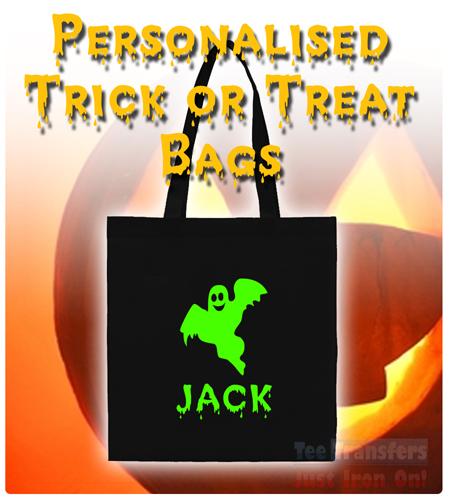 Our lovely Tote Bags are fairly strong, and made from cotton - so they will be brilliant for trick or treaters' - plus we use them - so we know they work perfectly with our iron on transfers. The handles are pretty long, so we just tied them in a loop to make it shorter for those smaller ones amongst us. A huge range of colours can be ordered to suit virtually any Halloween costume you choose to wear. Although we have a big stock of the tote bags, delivery will not be as quick as the iron on transfers. If you order iron on transfers at the same time as the tote bags, we will send both together a few days after your order if we have no stock of the tote bags.